I am very pleased to be one of the 10 bloggers taking part in the Davina for Next fitness challenge. 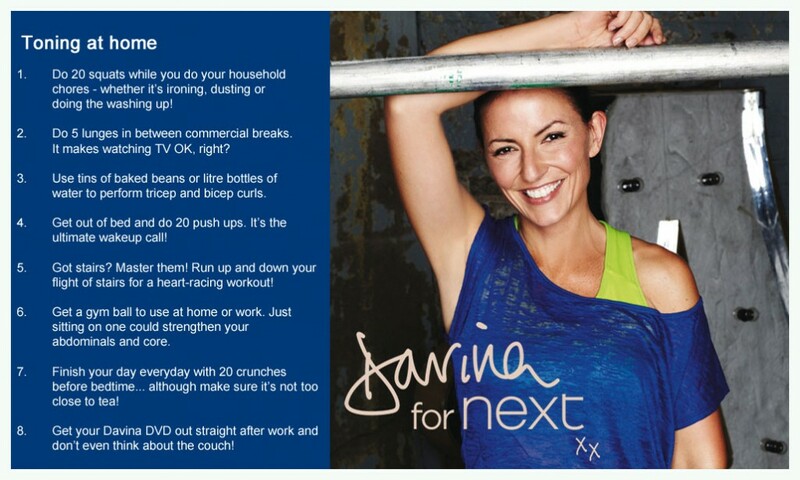 From today until the 15th February we will be on a ‘Get fit with Davina’ challenge. For me, this will indeed be a challenge. Its been over 5 years since I did any exercise other than running around after the kids, to say I am unfit and out of practise at exercising is an understatement to say the least. My biggest problem is lack of time. I have the children all day and then am usually too tired in the evenings, but I have a plan. I’m going to fit in bits of exercise to my everyday activities, running up the stairs, a few lunges here and there and some squats. Hopefully the kids won’t think I’ve lost my mind. I’m going to get out and about with the children more. We are going to go on lots more bike and scooter rides even when the weather is rubbish. We are going to run around in the garden more. We are going to do sit ups and press ups together. I am going to try an evening/weekend run. I am going to choose healthier snacks. My target for the next few weeks is to get myself back into a fitness routine, a healthier diet and generally feeling better about myself. Davina and Next have sent us some great tips, so I’ll be keeping you posted on how I get on, and of course telling you what I think of my new trainers and fitness wear. I especially like these tips for exercising in the home. I’m quite a fan of Davina’s fitness, I find her really motivating. Good luck and I look forward to following your progress. Yes, I just need to stick to them! I missed this on Friday…..good for you! Can’t wait to see some videos of you & the kids doing sit-ups! !